In this tutorial you will learn how to setup Cloudflare CDN for your WordPress website on Google Cloud. When configured correctly, Cloudflare CDN can provide huge performance and security benefits for your website. Serving your website’s content from CloudFlare’s CDN will lead to huge performance benefits, including shorter load times and protection from DDOS attacks. A CDN is a network of globally distributed servers that store and distribute your website’s content. With a CDN configured, your website’s content will load quickly for all users, regardless of their geographic location. Without a CDN, your website is served from a single server, meaning slow load times for international visitors. With a CDN, your website is stored and served from many servers around the world, meaning consistently shorter load times for visitors. 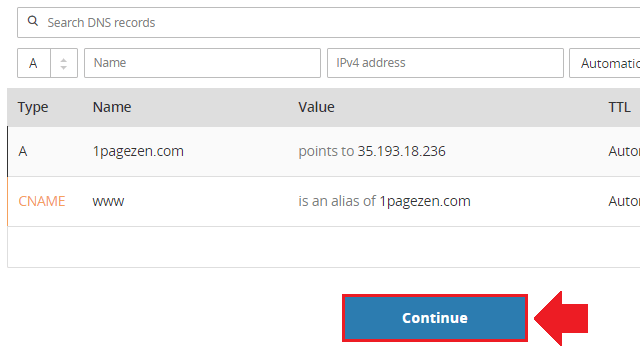 Reserved a Static IP Address for your website. Configured SSL for your website (optional). 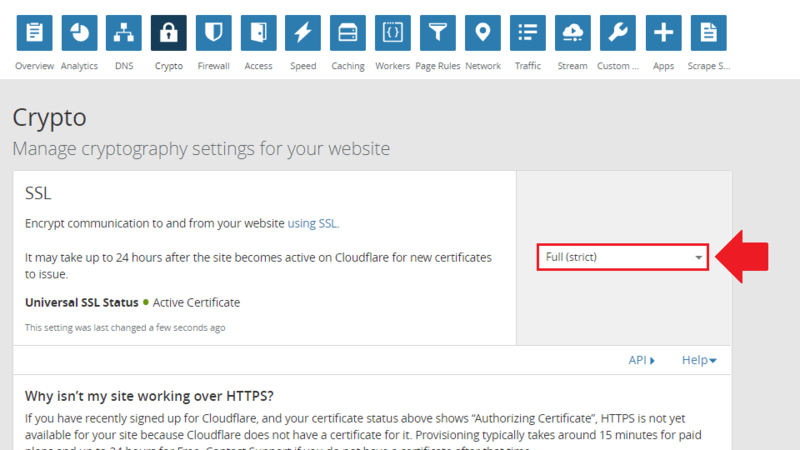 If you don’t want to install your own SSL certificate, it is possible to use Cloudflare’s SSL service with your CDN. You will have the option to apply this setting in step 3 of this tutorial. Learn more about the advantages and disadvantages of using Cloudflare’s SSL service with your CDN by clicking here. In your web browser, navigate to the Cloudflare signup page. On the signup page, choose an email and password to use for your account, and click the Create Account button. 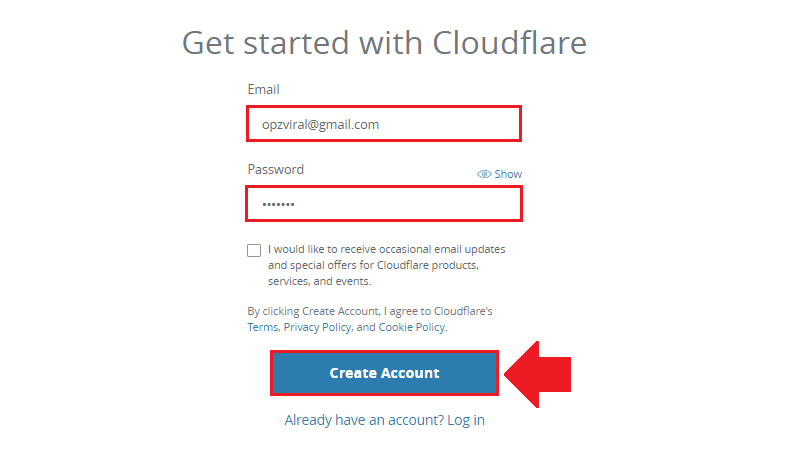 After creating an account, click the + Add a Site button to configure your website with Cloudflare. Click the Next button to query your DNS records. 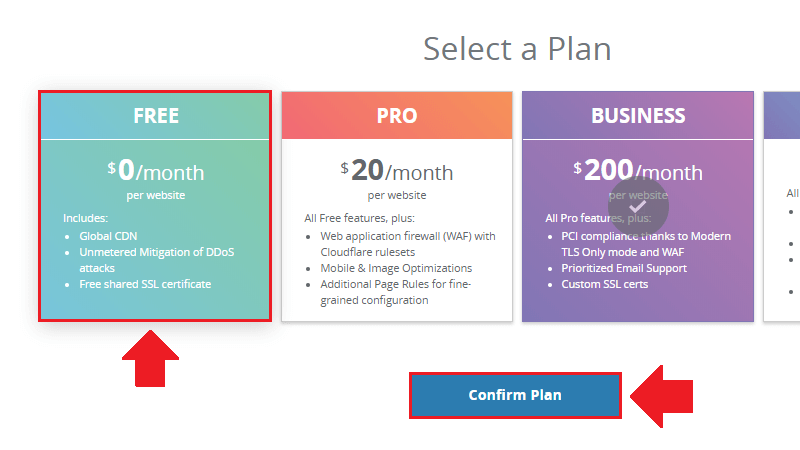 Select the FREE option to get started with a free account, then click on the Confirm Plan button. 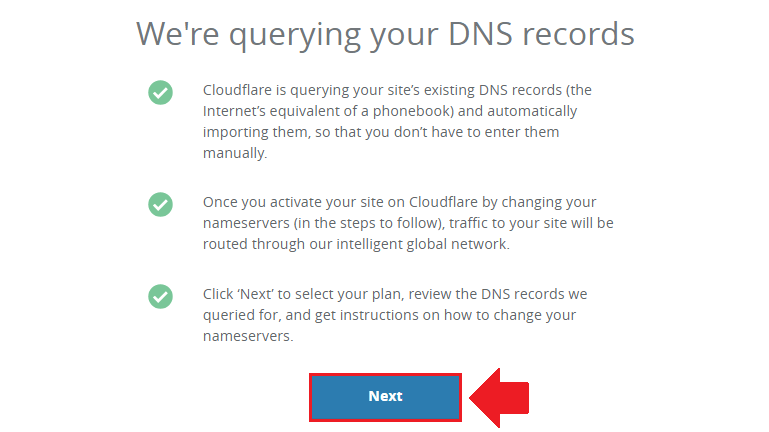 After Cloudflare has verified your website’s DNS records, click the Continue button. Copy the two nameservers that Cloudflare provides and paste them into Notepad – you will need these in the future steps. Visit the domain name provider where you registered your website’s domain name. 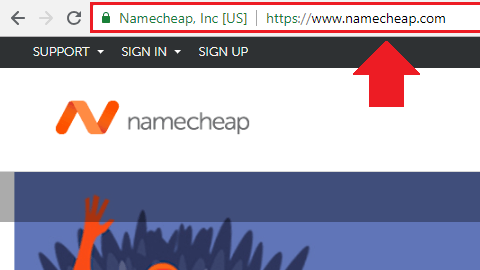 Namecheap is used in this example, but there are hundreds of other domain name registrars to choose from. Once you’ve logged in to your domain name registrar, navigate to the settings page of the domain that you want to configure. 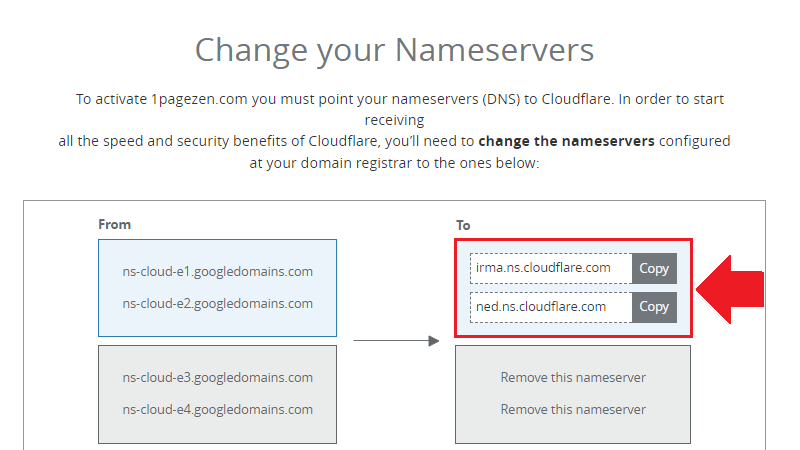 Select the Custom DNS option, then paste the two Cloudflare nameservers that we copied from step 1 of this tutorial. Go back to your Cloudflare homepage and click on your website. 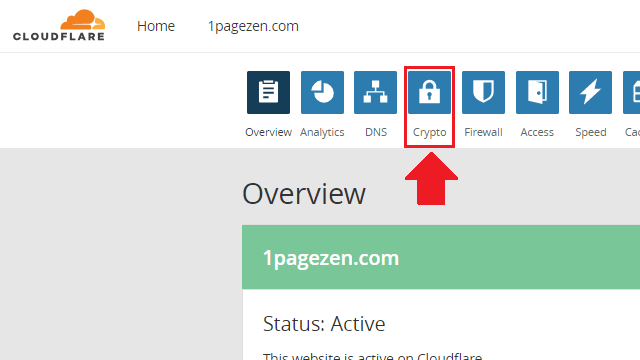 Click on the Crypto icon at the top of the page to configure your Cloudflare SSL settings. On the Crypto page, select the Full (Strict) SSL setting if you already have SSL configured on your website. If you want to use Cloudflare’s SSL, choose the Full SSL setting. Click here to learn more about the different SSL settings. Next, click on the Caching icon at the top of the page to configure your caching settings. Set your Browser Cache Expiration setting to 1 month, or choose Respect Existing Headers if you’ve already configured caching on your origin server. 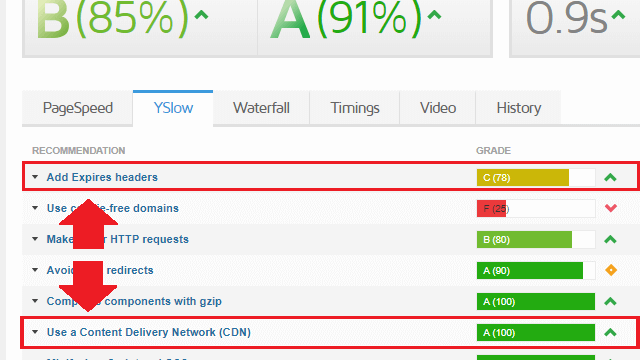 Now that you’ve configured Cloudflare CDN, the next step is to check that it is working properly. In your browser, open a new tab and visit GTMetrix. Then, enter your website’s URL in the search field and click the span style=”background-color: #eee”>Analyze button. 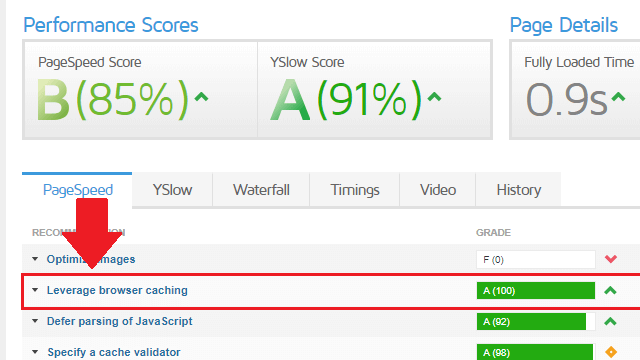 First, under the PageSpeed tab, check that the Leverage browser caching criteria has a high score. Next, navigate to the YSlow tab and check that the Use a Content Delivery Network (CDN) and the Add Expires headers criteria are both met. 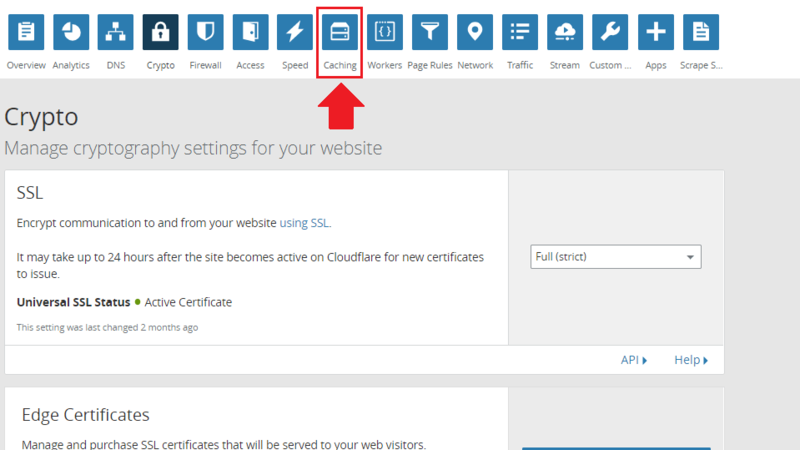 Cloudflare offers three separate settings for handling your website’s encryption with SSL. The three settings are Flexible SSL, Full SSL, and Full SSL (Strict). Full SSL (Strict) provides the highest level of SSL security, however, it requires that you setup SSL on your origin server beforehand. 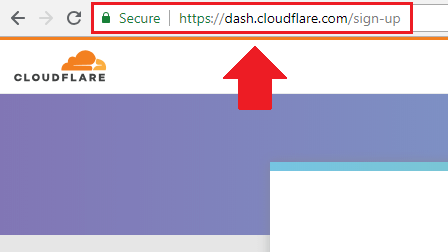 Flexible SSL is the easiest setting for configuring Cloudflare’s SSL with your website, but unfortunately does not encrypt the connection between your website’s server and Cloudflare (your website will still show the green padlock). Unlike Flexible SSL, the Full SSL setting provides encryption between your server and Cloudflare. The only drawback is that your connection between your server and Cloudflare isn’t authenticated. Out of the three available settings, Full SSL (Strict) provides the highest level of security. Unlike Full SSL, the Full SSL (Strict) setting ensures than the connection between your website’s server and cloudflare is authenticated with a signed SSL certificate. Which setting should you choose? Try to avoid using the Flexible SSL setting. If you’re running any of the ‘pre-configured’ stacks from the Google Cloud solutions library, then it’s likely your server came pre-configured with self-signed SSL certificates. This means that the Full SSL setting is available to you by default. We strongly suggest that people use Strict mode with a valid cert on their origin. –Nick Sullivan, Head of Cryptography, Cloudflare Inc. However, if you want to take your security a bit further, you can use the Full SSL (Strict) setting. This setting requires that you already have SSL configured on your server (with valid certificates). If you plan to use the Full SSL (Strict) setting but haven’t yet configured SSL certificates on your server, check out the SSL tutorials for the Click-to-deploy or Bitnami Google Cloud LAMP stacks. What are the disadvantages of using Cloudflare? If you have any questions or comments, please leave them in the comment field below. For troubleshooting support, be sure to check out the WordPress Cloud Hosting Support Group on Facebook. But sometimes Cloudfare will actually slow down your website loading pages ..
It’s possible that the system they use for checking bots may make result in slightly longer load times. However, the benefit to this is that your website is protected from DDoS attacks. If you’re referring to something else, please provide more information/sources. After completing the steps my website no longer loads up. I keep getting page cannot be reached and I cannot get to wp dashboard. Were you able to get the issue resolved? If so – what was the issue? Many thanks for your easy tuto. So I remove the cloudfare dns and got restored the google originals DNS (my domain name as been registered with google domain). But unfortunately, my wordpress website has disappeared now from the net. My browser can’t detect any IP address. If you opt to use Cloudflare, you will have to import all of your existing DNS records (for email, this would be your MX, SPF, and DKIM records) into Cloudflare in order for your configuration to continue to work correctly. Can I have a tutorial request: how to setup multi country subdomain between cloudflare and gcp separate VMs? Thank you so much in advance. Your website is cool, I am your die-hard fan!!! Do I still need to set up wordpress cache (W3TotalCache) or nginx cache? No – you can handle these configuration settings in your Cloudflare dashboard. I haven’t done this. 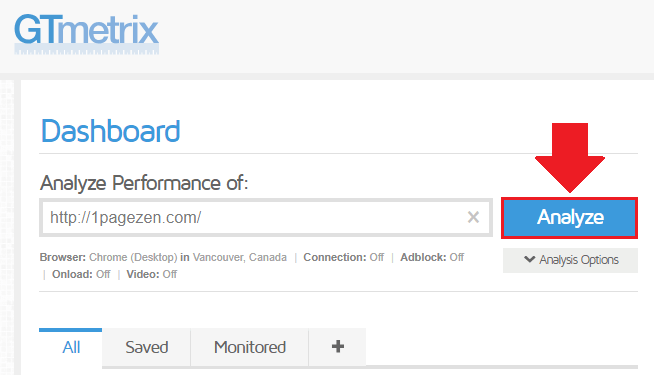 But, is there option to not cache some pages on cloudflare (e.g. carts, checkout, wpadmin, etc.)? 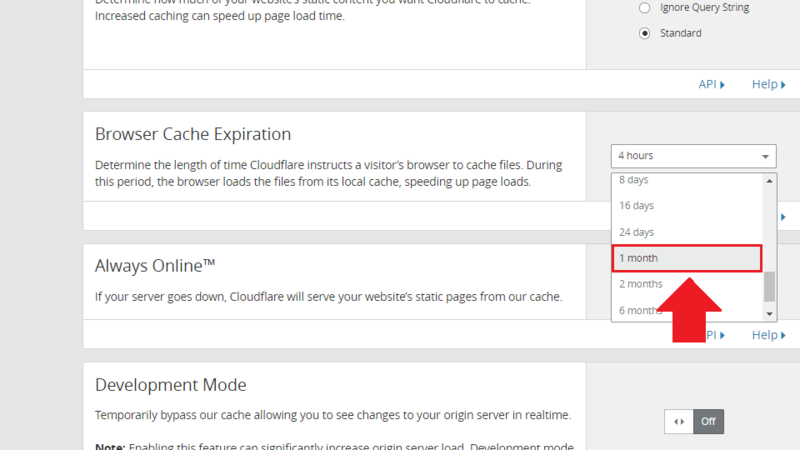 Cloudflare provides free accounts with a few page rules which you can use for advanced caching configurations. This is a common error with Cloudflare. Check out this resource for more information. first of all i would like to thank you a lot for your tutorials, it´s amazing how much i learned in the last weeks setting up my first WordPress site on google cloud host! But in general, is it possible to run a website on google cloud on two machines? In my case: I want to target customers in Germany and in the USA. I chose a machine in Frankfurt, which gets me a decent siteload time for tests from Germany, if i try from the US its still way to long, even with the CDN. I would not mind paying for a second machine in the US, if it gets me the same speed. Do you know if this is possible? If you have shared website traffic between USA and Germany, then running instances in both of these regions would definitely improve your website’s performance. To do this, you could create an HTTPS cross-region load balancer to direct traffic to either your USA or Germany instances, depending on your user’s proximity. With the load balancer configured, you could then enable Google Cloud CDN. Other ideas to consider are using Cloud SQL as your database solution and configuring the WP Stateless plugin to serve your WordPress static content from multi-regional storage; this would therefor serve as your [very fast] CDN. You should note that these types of configurations are expensive, which is why it’s important to factor cost/performance. Google Cloud has a tutorial covering the basic load balancing concepts in the documentation if you’re interested. Also, check out this resource for more information on Google Cloud CDN. Hope this is helpful, and let me know if you have any questions. Yes – will do in the future! Thanks for the suggestion Mukesh! I’m trying to get this working with a Google Compute VM Instance – WordPress Click to Deploy, but I’m getting a cloudflare 521 error trying to connect to the google static IP. Any ideas on how to get this working? I’ve gone back to using our old host for the time being until I can get this google vm working. 1. Get a cheap domain for testing purposes. 2. Launch a WordPress install on a new VM. 3. Make sure the domain and URL are configured properly with Google Cloud, then migrate to Cloudflare. Although it is recommended to have SSL configured before migrating to Cloudflare, you could migrate to Cloudflare and then use Cloudflare’s SSL service, as this will save you a step and simplify the process. sir i have question i am using google cloud wordpress hosting and dns i i add in godaddy dns server if i remove and i put cloudflare dns there then my website still work or no becuse my google cloud dns removed. please answer me fast brother. Before configuring Cloudflare and changing your GoDaddy namerserver to point to Cloudflare, you need to ensure that your website is working properly on it’s own, either with or without SSL configured. I changed mydomain’s nameservers to Cloudflare’s and I enabled Flexible SSL (Didn’t set up SSL with “Let’s Encrypt” or anything before that). After a few hours it said the SSL certificate was active so I browsed my website and it wasn’t redirecting to HTTPS so I went into WordPress settings and changed both link from http://oneprivateip.com to https://oneprivateip.com. Right after clicking “save” the page doesn’t load. I want to switch back the links to HTTP in WordPress settings but because of the above I have no way to access the admin page. Is there a way to do it with SSH or any other solution? 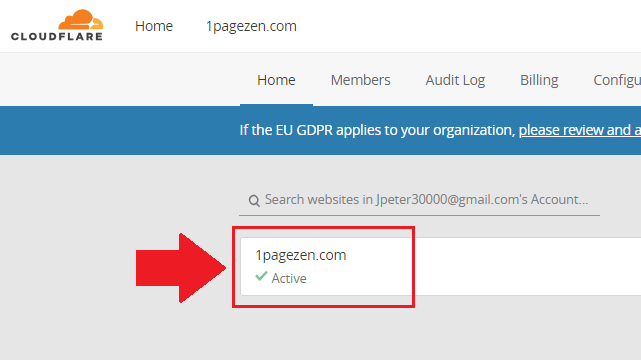 You can force change your domain by following the instructions in this article here. Depending on which WordPress stack you’re using, you will have to navigate to the WordPress directory that is housing all of your files, then edit your current theme’s functions.php file (the second method from the link above). Delete those lines, save the file, restart Apache, and it should (hopefully) fix the problem. great tutorial, although I have my doubts that adding an extra layer of complexity to the excellent Google Cloud Infrastructure could add perceived benefits. For now I won’t implement the excellent Cloudflare into my project, since I’m pretty sure it will mess up with other things (like page cache, AMP, CDNSEC, etc…) and the marginal (over Google Cloud Hosting) speed and security improvements doesn’t really worth it. Hi. Have a question… If nothing is changed in YSlow Score where i can do something wrong… your tutorial is pretty straightforward. Maybe i can hire you to setup it for me or… i don’t know. Unfortunately you won’t notice any improvement right away, as CloudFlare needs time to identify where to cache your content. That being said, you also won’t notice any improvement if your’re running a test from a server that is located close to your origin server (aka the primary server location where your website is hosted). For instance, if your Google Cloud instance is being hosted at a US West region data center, and you run a GTMetrix test from the GTMetrix default location in Vancouver, then your load time will be extremely fast regardless of whether or not a CDN is enabled. The real purpose of a CDN is to cache your website’s content in locations that are far from your origin server – say in Japan, or Europe. As Cloudflare monitors the location of your website’s traffic over time, you will notice that your content is being cached and served from locations closer to these ‘international’ users. So – my advice is to wait a week or two, then test your website using a website tool that checks your website’s load times from multiple servers across the globe. I recommend this tool. It won’t be long before you notice your website’s load times decreasing for your international visitors! It was a bit more complicated step than other guides! But all THANKS TO YOU LERON AMIN..! Thank you for doing a great job with the whole tutorial. I was able to do the hard part from installing wordpress all the way to setting up SSL correctly. With setting up the CDN, when I add my domain to cloudfare, it is giving me “This zone is banned and cannot be added to Cloudfare at this time.” What’s causing this? I did a Google search for the issue, and it doesn’t look like there is a simple fix. From what I’ve read, you’ll need to contact CloudFlare support. what is your opinion in using google cloud CDN or Cloudflare CDN? I’m glad to hear you were anticipating the tutorial. Both CloudFlare and Google Cloud CDN have incredibly advanced and expansive networks. So between the two, it really comes down to specific use cases, because their performance metrics will be comparable. Now the reason I really like CloudFlare CDN is because it’s a free service and is easy to set up. It also comes packaged with additional features such as cache configuration, one-click SSL, Always Online, and DDos protection – to name a few. On the other hand, Google Cloud CDN offers more flexibility than CloudFlare – but is also significantly more difficult to configure. For that reason, it’s a service that should be ‘grown into’ only when necessary. On One Page Zen, most of the tutorials center around using persistent disk images to host static content – this makes it easier for beginners to get started in the cloud, but also doesn’t fit the CI/CD model that Google Cloud CDN was built to support. In the future I will do a load-balancing tutorial on running WordPress in an environment where you’re pushing code changes to multiple VM’s, as this would be a use case that would fit best with using Google Cloud CDN over CloudFlare. Hope this information was helpful, and let me know if you have any questions. 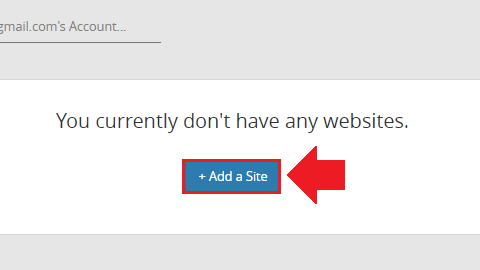 After setting all this up, Gtmetrix tells me to avoid landing page redirects – how is that corrected in bitnami wordpress? Landing page redirects will occur whenever you set a preferred version of your domain. For instance, if you set your preferred domain to the non-www version of your domain, then your users will be redirected to this version of the domain whenever they visit your website with the www prefix. The GTMetrix notification is simply a making a point that these redirects slow down your page load time – which they do – but there’s not much that you can do about them. The only workaround I can think of would be to run identical instances of your website from both the www and non-www versions of your domain. Thank you for this another very detailed and useful tutorial. Yay! I successfully installed CDN on my website for free. Thanks for the feedback – I’m glad to hear the tutorial worked for you! I changed name server but can not load my site..
What have you you done so far to troubleshoot? What type of error do you see when trying to access your website?